Adnan Ertem, General Director of the Directorate General of Foundations of Turkey, has given a comical explanation in connection with the expropriation of the functioning Surp (Saint) Giragos Armenian Church in Sur district of Diyarbakır city. Ertem told Agos Armenian bilingual weekly of Istanbul that the expropriation of all buildings in Sur is not aimed at historic structures. He argued that this expropriation plan envisions the preservation of the historic structures around which numerous illegal buildings were constructed. According to the Turkish Council of Ministers’ decision, all structures in Sur district of Diyarbakır, including the Surp Giragos Church, have been expropriated. The Surp Giragos, which is one of the largest churches in the Middle East, had reopened as a functioning church and was reconsecrated in October 2011. The church was renovated with the co-funding by Diyarbakır Armenians throughout the world and Diyarbakır City Hall. So Surp Giragos of Dicranakerts was taken to preserve it, keep it in good shape, because the people who built it might not take care of it properly. inquiry form on his Facebook page. living in Sur will be protected. not contradict the legislation and the Treaty of Lausanne. also expropriated, "Armenpress" reports, citing the Armenian "Agos"
over 6000 properties in the area. been filed against this action in local courts, Asbarez reports. Chaldean and Protestant churches are also expropriated. Protestant churches are also expropriated. neighborhoods in YeniÅ?ehir province are expropriated. owners of the expropriated properties to take legal action. Sur is the only center that have places of worship for non-Muslims. awarded with various prestigious restoration awards. O'mid, Emit, Amide, Amedu, Kara Amid, Dikranagerd, Diyarbekir. Armenians are being researched and new researchers are welcome. forget your homeland? They couldn't have forgotten it. buildings. They wanted to wipe the traces of Armenian masonry off. Saruhan and Yeram in 1729. Damaged in 1915, the church was used as quarters by German commanders. opened to worship in 2011. MP Aragats Akhoyan said at a press conference on Thursday. of primarily Kurdish-populated Diyarbakır city. In his words, this confiscation is simply a disgrace. throughout the world and Diyarbakır City Hall. St Giragos Armenian Apostolic church in Diyarbakır, Turkey, photographed after a restoration in 2012. Some of the most important Armenian and other churches in the Middle East have been appropriated by the government of Turkey, according to reports emerging from the region. 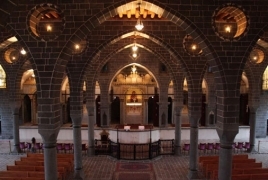 The churches include the Surp Giragos Armenian Apostolic and the Armenian Catholic churches in the Sur district of Diyarbakir. According to the Turkish-Armenian newspaper Agos, the government decided to take over 6,300 plots of land in total. The paper reported that the Surp Sarkis Chaldean Church, the Virgin Mary Ancient Assyrian Church and the city's Protestant church were among the buildings taken over. Even buildings owned by the local government were taken, according to Nevin Soylukaya, the local heritage director. Local officials are planning legal action to get their buildings back. Priests hold a mass at Surp Asdvadzadzin Patriarchal Church in Istanbul in April last year, as part of events to commemorate the victims of the Armenian genocide that took place during and after World War I.
Diyarbakir, also known as Amid, is on the west bank of the Tigris and is one of the oldest continually inhabited cities in the world, according to the Facebook page of two of the churches, where members are discussing how to respond to what they refer to as the "nationalisation" of the buildings. The Armenian Catholic Church of Diyarbakir is understood to have been badly damaged recently during clashes between Turkish armed forces and Kurdish militants. The most important mosque in Sur, originally a church that was converted in the 16th century, has also been burned down. The Armenian National Committee of America called for President Obama to act. The US Embassy in Ankara and consulates in Adana and Istanbul are understood to be tracking the recent cabinet decree and haveraised the issue with both the central government and local authorities. The Turkish government has informed US officials that the decree is "a bureaucratic measure" to facilitate the restoration of structures damaged during fighting in recent months. Aram Hamparian of the Armenian National Committee said: "We welcome this initial US engagement with the Turkish government regarding the confiscation of Surp Giragos and encourage a strong, public American response to this most recent Turkish attack on religious freedom. In light of Turkey's brutal record of destroying and desecrating Armenian religious and cultural heritage, it is clear that this latest action represents a renewed attack by Erdogan on Christian communities, a continuation of Ankara's efforts to erase the ancient Christian legacy within its present-day borders, and, ultimately – more than a century after 1915 – a further consolidation by Turkey of the fruits of the Armenian Genocide." Raffi Bedrosyan is a man on a mission. and bullet holes in the walls,” Bedrosyan said. personal connection to the church. 1915 Armenian genocide, the church was also destroyed, Bedrosyan said. collapsed by early 2000s, he said. Many of these people are now very frustrated and angry, Bedrosyan said. other properties that were confiscated along with it, Bedrosyan said. launch lawsuits against the Turkish government. to get involved in this issue, Bedrosyan said. are quite childish,” Bedrosyan said. and build new housing where buildings have been damaged beyond repair. Bedrosyan says he doesn’t buy that argument. you don’t need to expropriate the church,” Bedrosyan said. by the government, Bedrosyan said. announced all the addresses of the properties to be expropriated. confiscation process. Others beg to differ. population distribution shows Sur was an Armenian majority town. estimated to have been expropriated by the government. community of 100,000 in Diyarbakir until 1915,” he said. to serve different purposes, from an army barracks to a warehouse. a waqf foundation was able to reclaim the property. courage and determination to start reconstruction of [St.] Giragos. in 2011, and more than 4,000 people attended,” Bedrosyan said. spiritual refuge for hundreds of Islamized Armenian survivors. the AKP appeared to be embracing the rhetoric of religious freedom. pressure built, Prime Minister Ahmet Davutoglu visited Sur on April 1. Ozinian said, “Davutoglu’s first task at Sur was to pray at a mosque. seeking to halt its expropriation. annulling the urgent expropriation decision taken by cabinet. which also includes 174 properties belonging to the municipality. international laws, is a necessity in a state of law." Objection against expropriation of "publicly-owned properties"
servitude belonging to public institutions cannot be expropriated. him to finally gain his full control of Turkey. Things are getting closer than I thought. So lets start. over a millennia before Muhammad’s carcass rotted in Mecca. And the world says nothing! how to count heads and horns. crossed the Tiber, is beginning to spark. Kurd and then the Christian. like blood, but we can let the blood flow when it is needed”. mean applying serious pressure on free speech and shut down critique of Islam. “We have never left alone our Palestinian brothers so far,” he said. Justice is applied”. Get it? and now its no more, confiscated by Antichrist. in the system that will desecrate the Eucharist. claimed descent from John Tzelepes Komnenos. of fortresses” (war and castles), exactly as we see Erdogan already doing. the churches or control them to abide by his new Caliphate system. It is Antiochus all over again. But are the Maccabees within sight? the other cheek” and then we have the Church Militant, the love of my heart. the persecutors and the cowards? Lord have mercy. into an international tourism destination,” the New York Times said. said the properties will be returned once they are restored. preparing to take legal action against the order. with members of the international Armenian diaspora. hope for the renewal of the country’s ethnic Armenian community. Turkish government expropriated Surp Giragos and six other churches. efforts to make Diyarbakir a multiethnic religious center. widespread echo in the Armenian community worldwide." can be seen across the city. us. What was done to the Armenians in 1915 is now being done to Kurds. DIYARBAKIR, Turkey (A.W. )—The Armenian Weekly has received a set of secretly taken photographs inside Diyarbakir’s Surp Giragos Armenian Apostolic Church, off limits to the public since the most recent clashes between the Turkish military and Kurdish fighters in Diyarbakir. The photographs were taken in July 2017. Armenians from around the world flocked to Surp Giragos on Oct. 22, 2011, to attend both the consecration of the largest Armenian Church in the Middle East and the Badarak held the following day. The church had been recently renovated by the Surp Giragos Armenian Foundation, with the support of the local Kurdish-controlled municipality of the time. During the past two tumultuous years, the church has been desecrated and largely damaged, as the photographs show. These photos were captured by a Diyarbakir resident and sent to the Armenian Weekly on condition of anonymity. Intruders have broken into the Armenian church of Surb Giragos in Turkey's Diyarbakir, apparently with a sledgehammer that was used to smash altars and reliefs, Al-Monitor says. Little could the volunteers have known then that the ordeal involving the largest Armenian church in the Middle East was far from over. By the early 1980s, Surp Giragos was a church without a congregation as Diyarbakir’s Armenians dwindled away. Abandoned to its fate, the church fell into decay. When a new restoration began in 2008, only its walls were standing, with the windows broken, the roof collapsed and the interiors filled with soil. During the three-year restoration, every corner of the church was meticulously repaired. An expert craftsman — one of only three left in Turkey — was brought to Diyarbakir and worked for half a year to renovate and complete the seven altars. The overhaul was crowned with a new church bell, brought from Russia. As services resumed, the church became a meeting point for Armenians — natives of Diyarbakir but now scattered across the world — and an attraction for tourists visiting the city. This new atmosphere, however, was short-lived. In the fall off 2015, security forces cracked down on urban militants of the Kurdistan Workers Party, who had entrenched themselves behind ditches and barricades in residential areas in Sur, the ancient heart of Diyarbakir, where the church is nestled. Only months before the clashes erupted, UNESCO had put Sur on its World Heritage list. The militants used the church as an emplacement and infirmary to treat their wounded, as evidenced by the medical waste found later inside. As the security forces advanced, the militants left the church, and this time the security forces used it. After the monthslong clashes, the church emerged with its yard walls ruined and riddled with bullets. Still, the Armenian community took solace in the fact that the church itself was standing. The authorities promised to repair the church and return it to the community. The church was presumed to be under protection since the area remained sealed off even after the clashes ended in March 2016. Since then, however, the church has become the target of thieves, who broke in twice and stole various objects. How the thieves managed to sneak in remains a mystery, for even members of the church board need official permission to enter. Now the church is plundered.